I usually start with my kiddo’s lunches, but Miss G was out sick a day last week so today I’m starting with my husband’s lunch. I tried my hand at making Mujadara, a lentil dish with mixed rice and carmelized onions. It’s a very simple, budget-friendly recipe, and the key is to carmelize the onions well. The longer they cook, the sweeter they become. 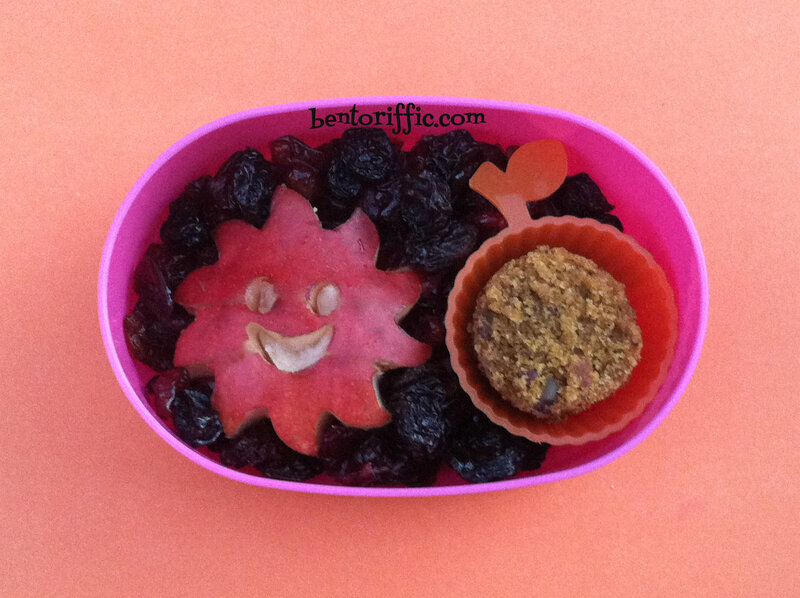 This recipe is revised from one I found through Vegetarian Times Magazine. I made about 3 cups of brown and wild rice. While the rice was cooking, I sliced 2 whole onions (I had red onions) in thin slices, and cooked them in about 1/8 cup of water on a medium-low heat adding water as necessary so they don’t stick. I sprinkled about 1/4 teaspoon of sea salt over the onions an cooked for roughly 30 minutes. 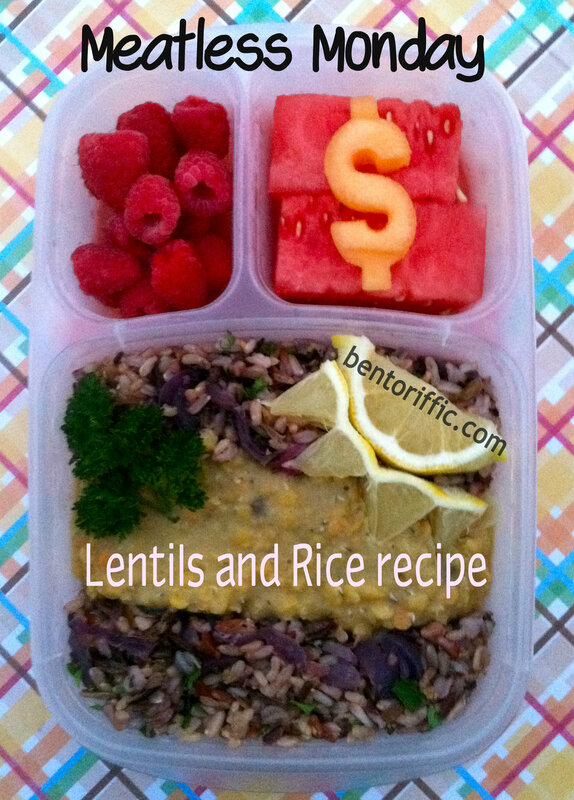 I used red lentils which is what I had in the pantry. While the onions were still cooking, I grated lemon zest and cut fresh parsley. When the rice was done cooking, I poured it into a large bowl, fluffed, and stirred in the onion, parsley, lemon zest, and cumin and then placed the rice mixture on plates and scooped the lentils on top. You can also garnish for dinner with a sprig of parsley or lemon wedges. It was very simple and delicious! 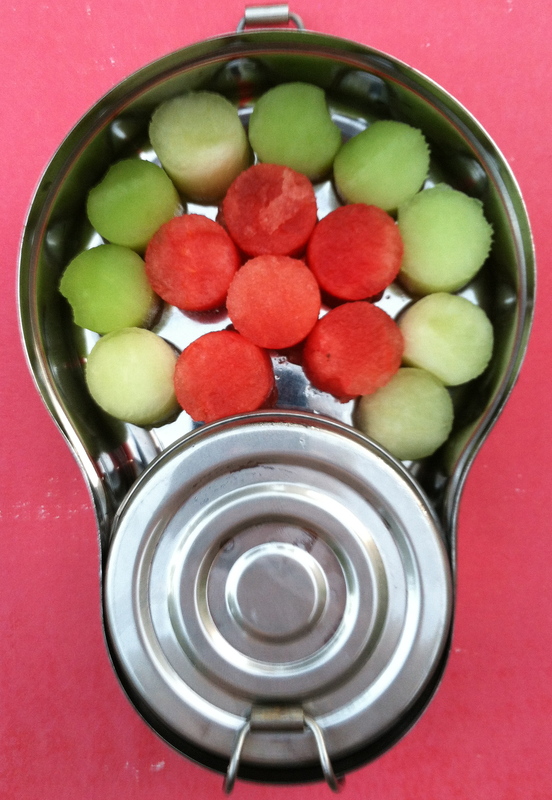 The above photo is the leftovers packed in an Easy LunchBoxes container with organic raspberries, watermelon and a cantaloupe $ sign for the breadwinner. I made a sun from the lemon wedges I zested and stuck a parsley sprig in for decoration. 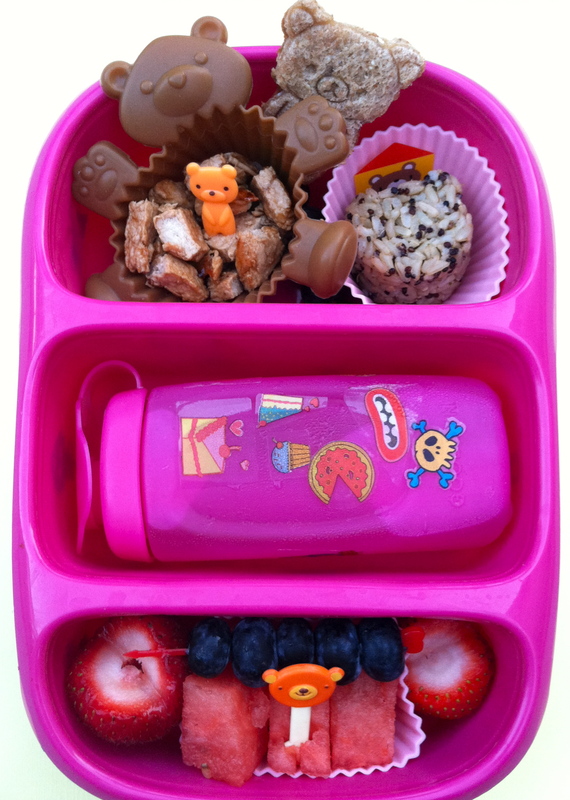 Little Miss A had a very simple bento herself. 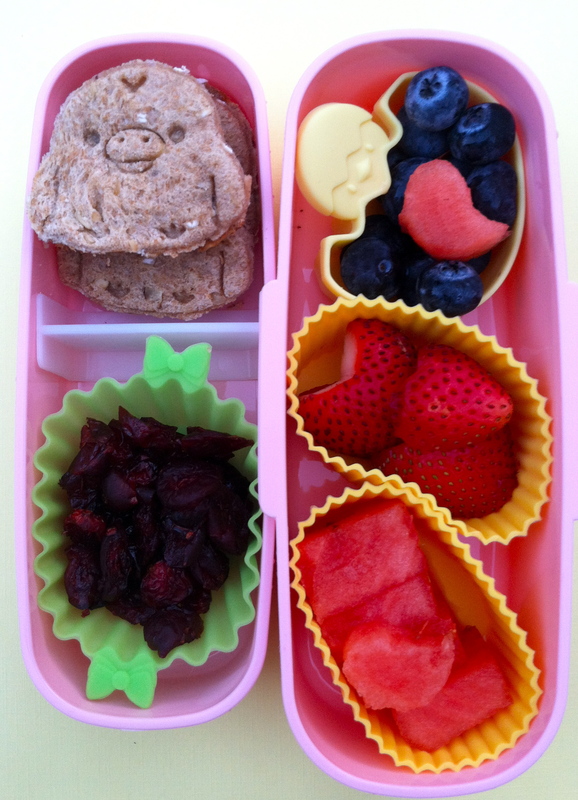 In her LunchBots Quad are organic fruits (grapes, raspberries and watermelon pieces) with small heart shaped almond butter sandwiches. For last night’s dinner we had quinoa pasta. 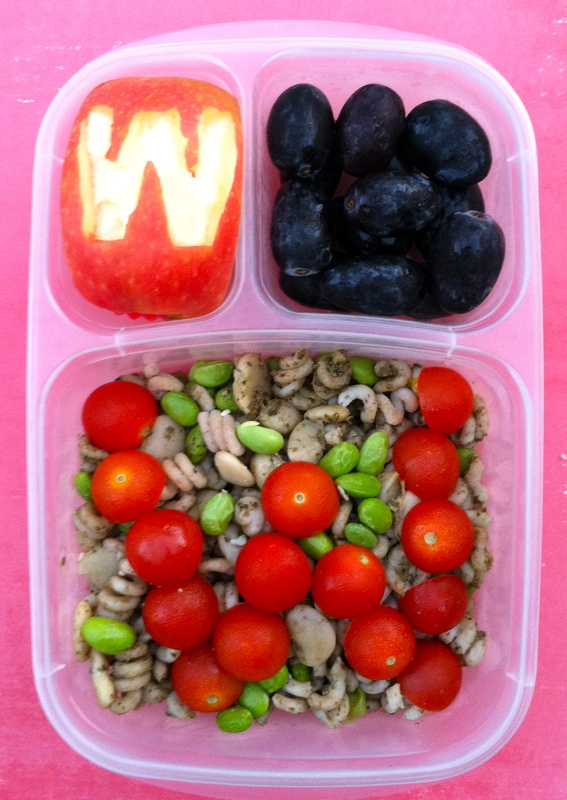 I love that I can find healthy, fun pasta for my kids in great shapes. The Quinoa Corporation makes these garden pagodas that I cooked with Lightlife brand vegan italian sausages and marinara sauce and grape tomatoes. The thing I really like about the quinoa pasta is that it’s organic, non-GMO (not genetically modified), gluten-free and use plant based colors. Better than that they don’t get mushy and my kids love them. 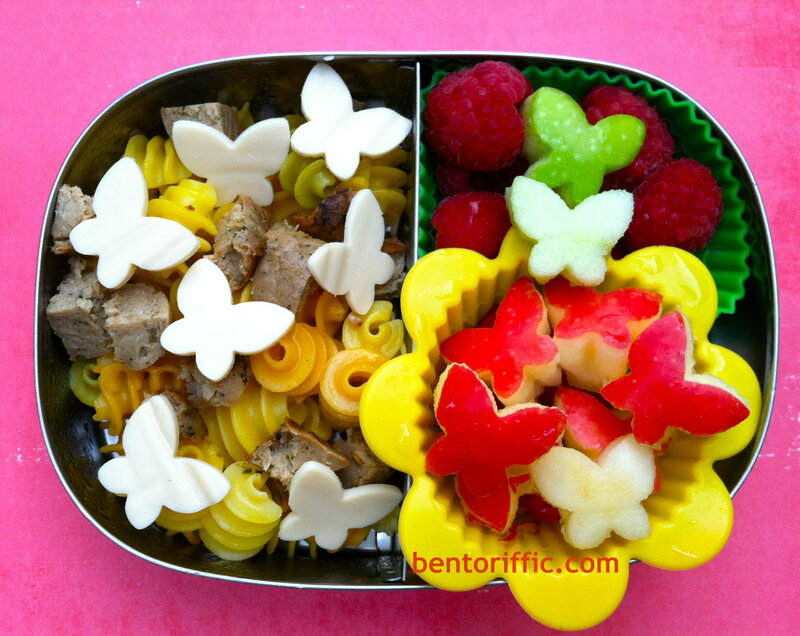 I decorated with vegan (non-dairy) cheese butterflies. 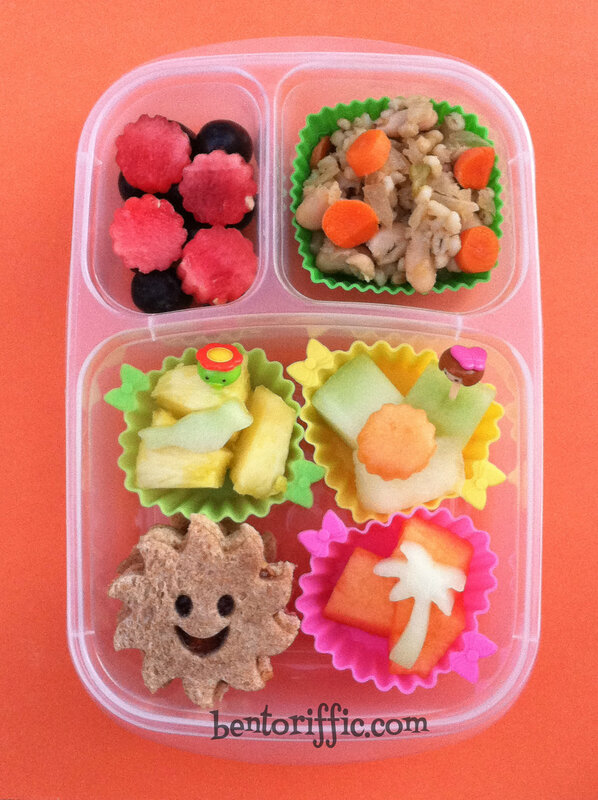 At the bottom are two small apple slices with a butterfly and a G for Miss G with the opposite color plugged into the cutout packed in her Goodbyn bynto lunchbox. 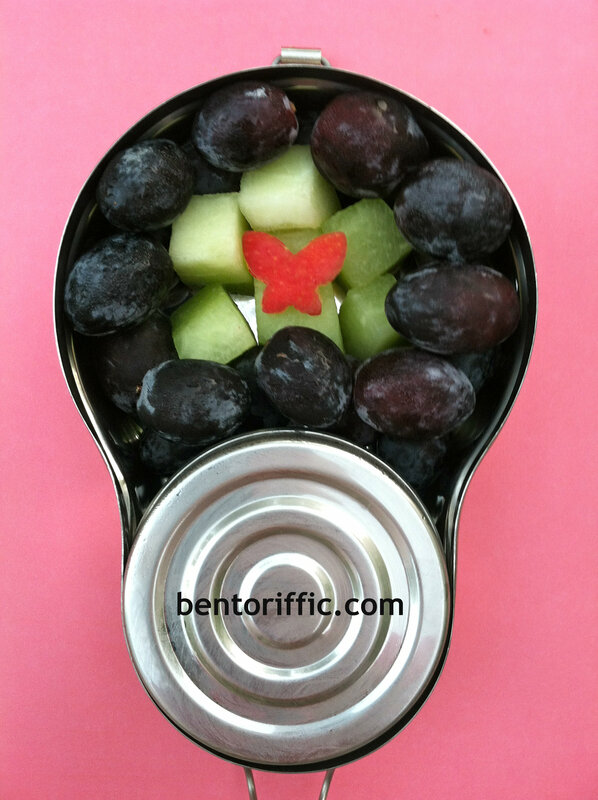 For her snack today, Miss G has black seedless grapes, honeydew melon and the red butterfly cutout from her apple in the middle packed in her Happy Tiffin stainless bento box. 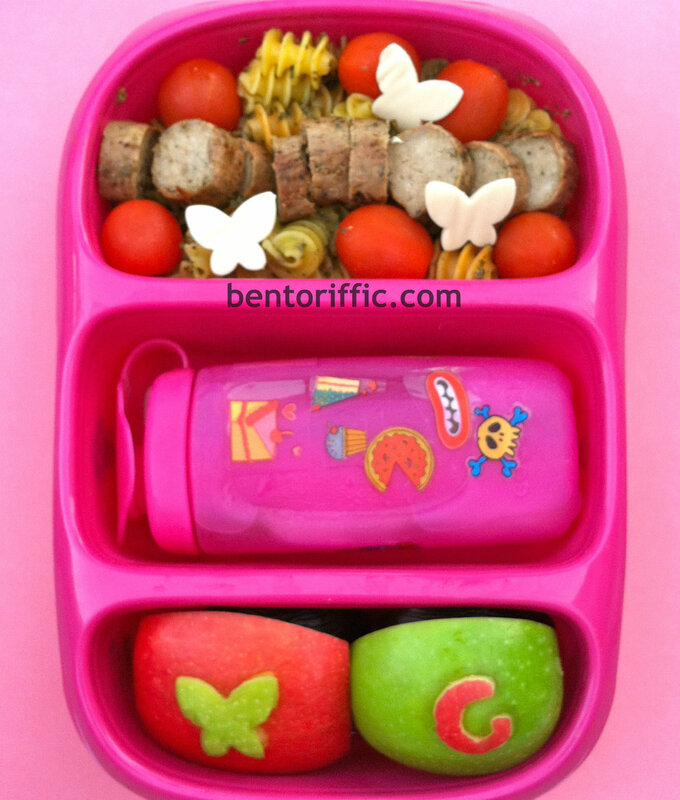 Little Miss 2 year old has the mini version of the same lunch of quinoa garden pagoda pasta, vegan italian sausage pieces, vegan cheese butterflies and a yellow flower cup of red and green apple butterfly pieces with raspberries at the top packed in her LunchBots Duo. 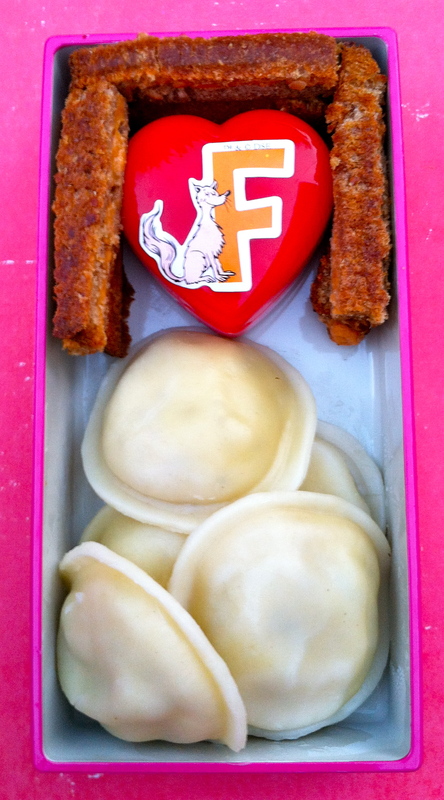 My husband’s lunch is the third more adult version with vegan cheese hearts, a plum at the top left and a d’anjou pear sliced at the top right packed in his Easy LunchBoxes container. Miss A has really been testing her 2 year-old limits and asserting herself at home, dressing herself and lunch is part of that too. She has been eating her sandwiches and leaving all else. So I did what any mean mom would do. I left the bread out. I used carrot flowers and put almond butter inbetween them to make carrot bites at the top left. At the top right are cucumber flowers with hummus in the middle. 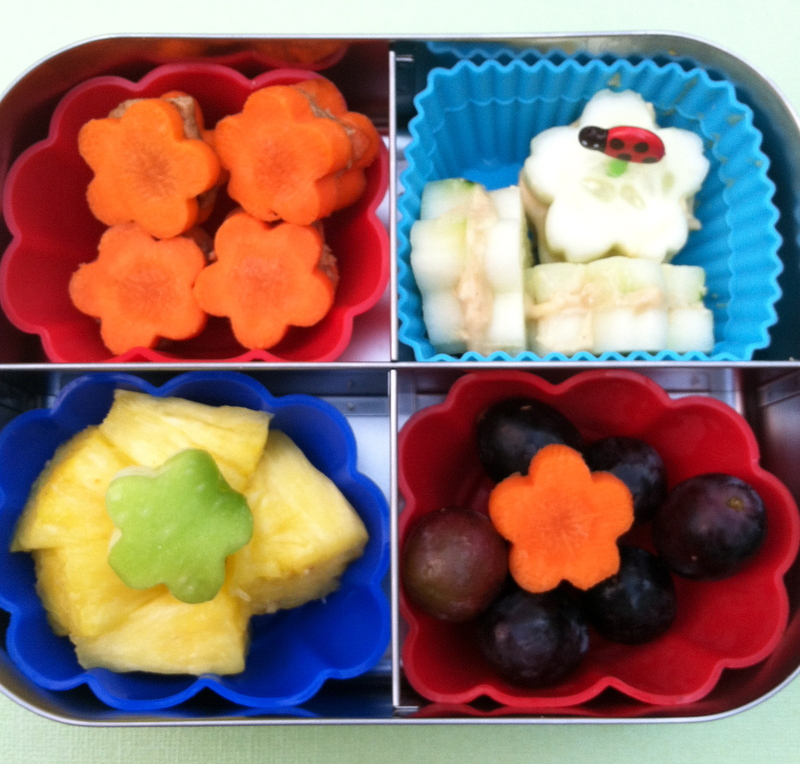 At the bottom right are red seedless grapes with a carrot flower on top and the bottom left are pineapple pieces with a green apple flower on top. 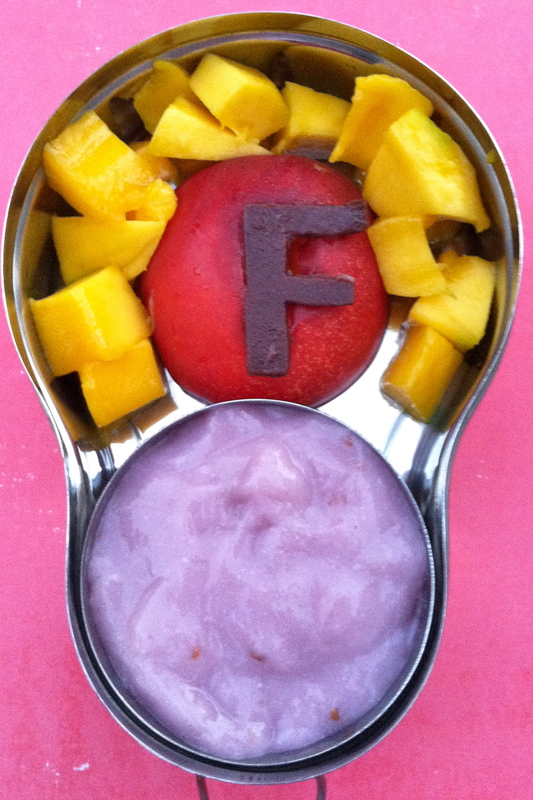 The bento box is a LunchBots “Quad” stainless container, perfect for a small toddler or adult snacks. Tomorrow is International Talk Like A Pirate Day. 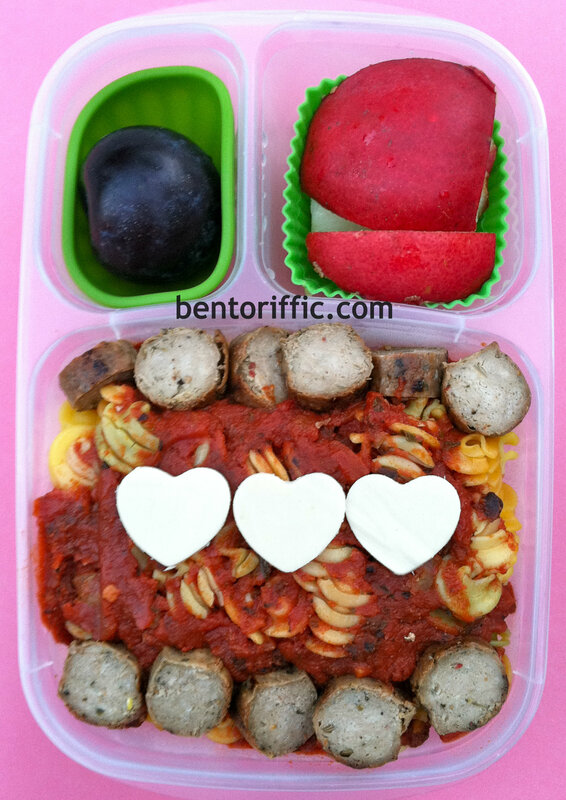 The Bento Bloggers and Friends are doing another blog hop. 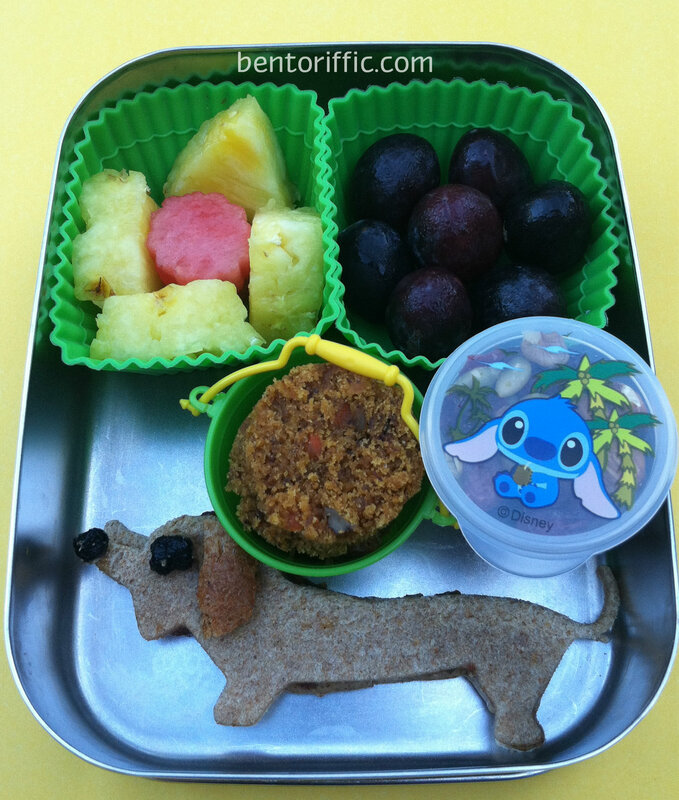 There are 30+ blogs involved with countless pirate themed lunches. More importantly, there is booty involved. NO, not that kind of booty. 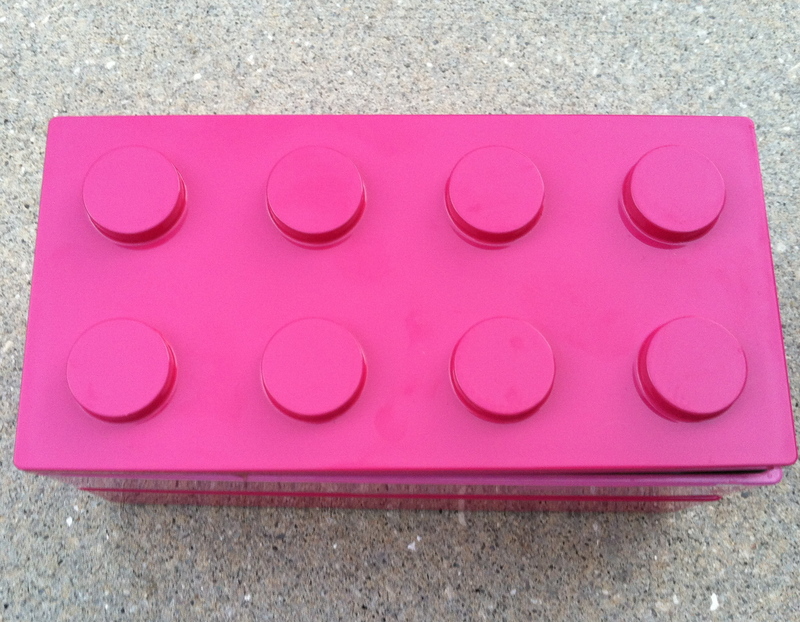 Loot, prizes to be won and lots of fun to be had. Please be sure to stop back tomorrow to make your way through all the blog hop. Or we’ll make ye walk the plank! 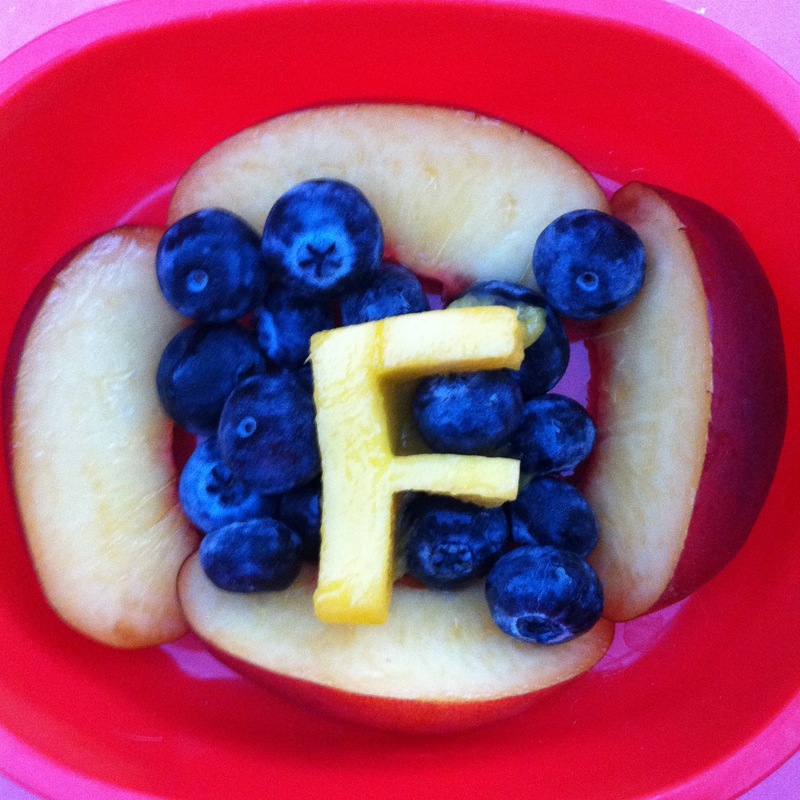 As long as I get creative with it, my kids will eat just about anything. I took last night’s teriyaki marinaded gardein brand (faux) chicken over brown rice with quinoa. 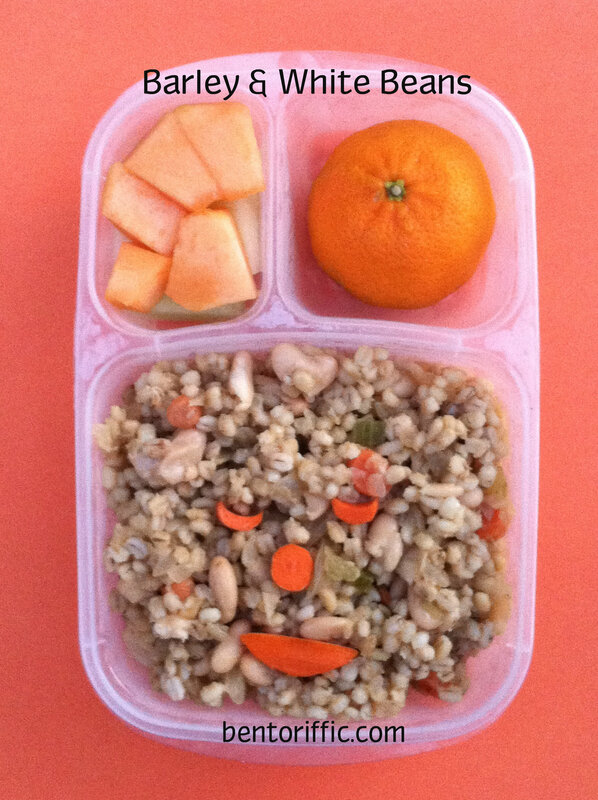 I used a bear shaped rice mold to reshape the rice/quinoa mix. The bear cup is filled with small pieces of the soy “chicken”. Behind the bears at the top are 2 small bear sandwiches. 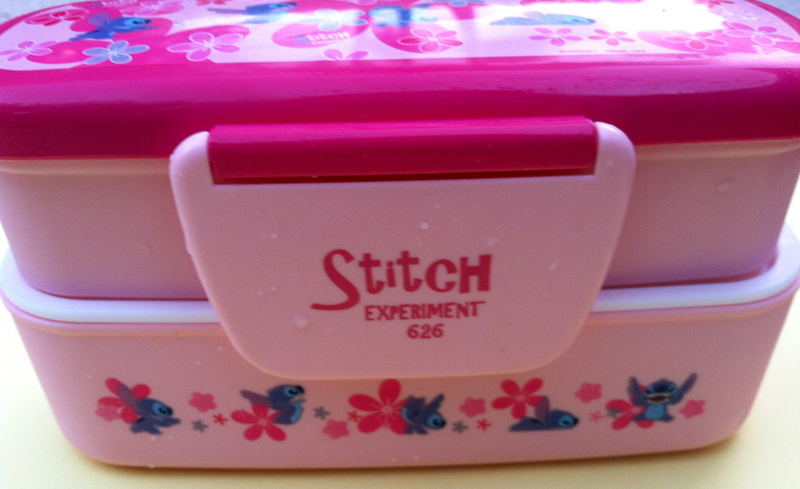 The water bottle in the middle compartment is great for keeping things compact in the lunch box, and it doesn’t leak. I do handwash this whole box and the bottle. 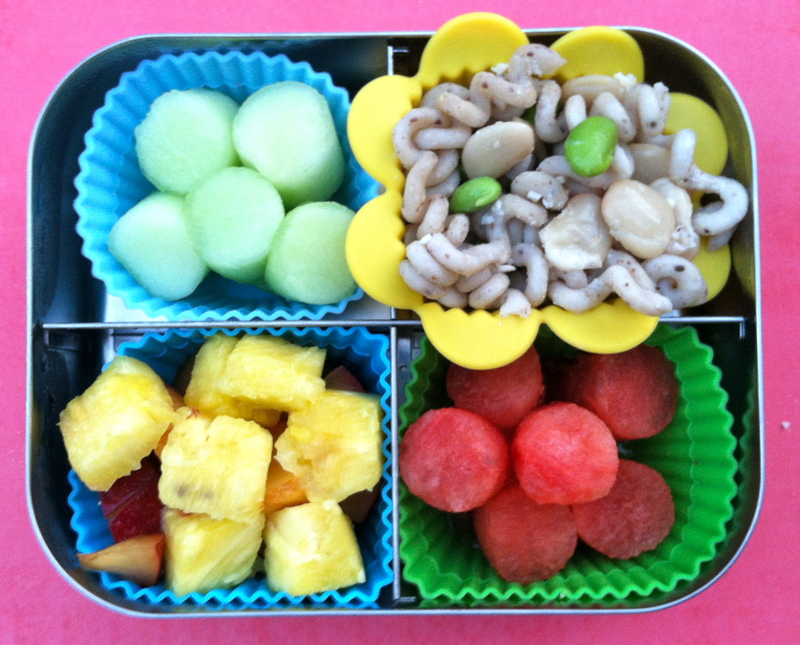 At the bottom are watermelon pieces in the middle, strawberries on the side and a skewer of blueberries packed in her Raspberry Goodbyn brand bynto lunchbox. 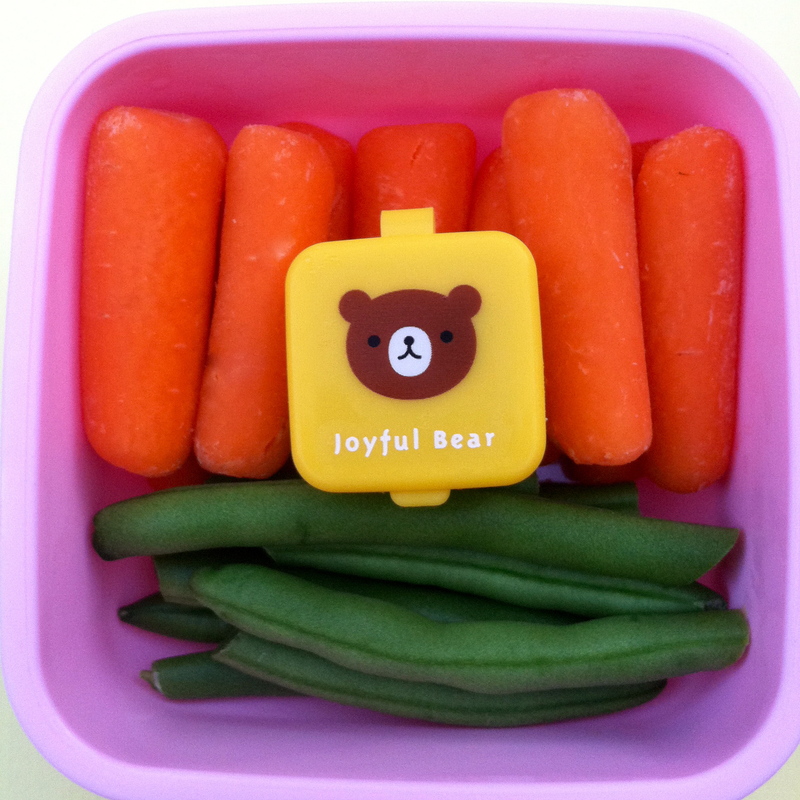 For her snack today Miss G has mini organic carrots and organic green beans with honey mustard to dip in the bear container. Miss A (2) is still allowed to take character themed items to school. 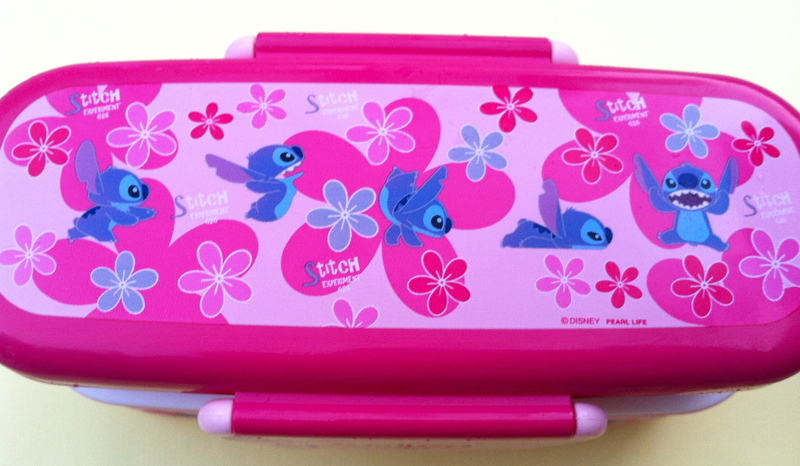 I found this small, 2-tiered bento box on eBay this summer with Stitch on it from Disney’s Lilo & Stitch. She LOVES it. We’ll be using it quite a bit this school year as it’s the perfect size for her. 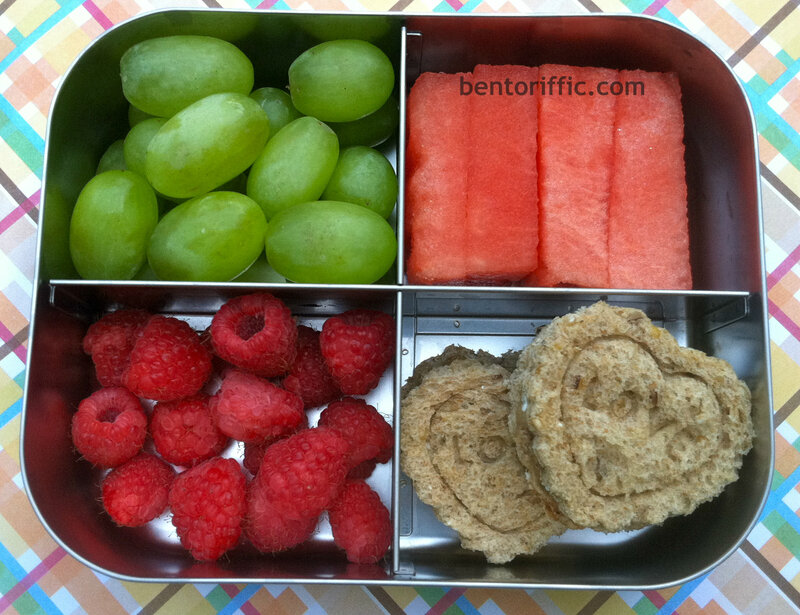 On the left are small almond butter sandwiches shaped like chicks and dried cranberries below. 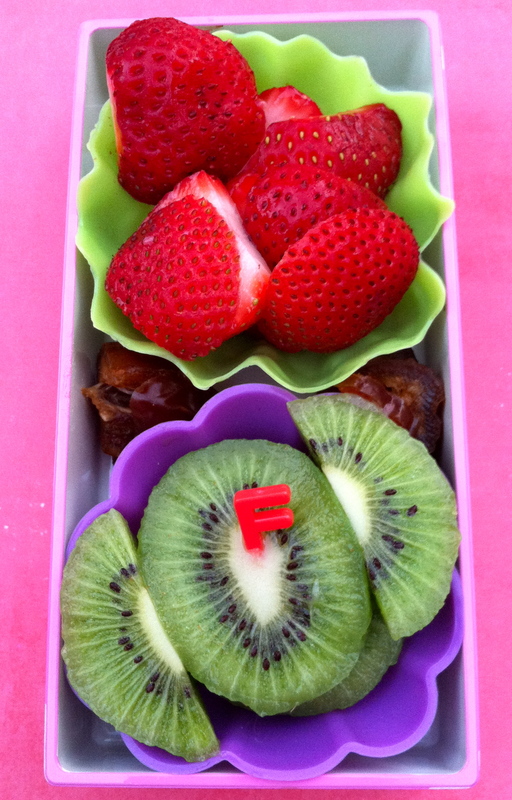 On the right are organic blueberries with a watermelon chick, strawberries and watermelon pieces. She also has a snack of nectarine and pineapple pieces not shown.